This month we are focusing on really encouraging the kids to swing the bat. Unfortunately the adult volunteer coaches and the baseball parents end up conditioning our ballplayers to NOT Swing the bat. When the hitters constantly get reprimanded when they go out of the strikezone to swing it or foul the pitch off the tongue-lashing barrage begins. After the hitters realize that if they DO NOT swing the bat then the chances of them getting the verbal lashing is diminished. Taking the pitch becomes the normal survival response. “If I keep the bat on my shoulder I’m safe,” is the instinctive reaction. I can do no wrong if I take the pitch. Kids go through season after season of puppy whipping. 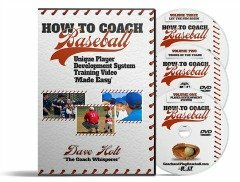 They will go to great lengths to avoid being slapped around---and try to not swing the bat until the pitcher or the count forces them to swing. By waiting on the pitch so long it makes it virtually impossible to get around on fastballs on time. The results are a very defensive minded hitter with little or no power and major frustrations for themselves, the coaches, the teammates and the families. Three easy tips for any level of baseball pitchers. Keep the game as simple as possible. There is no need to complicate the issues. Do these three things and you should be a successful pitcher.